Every cell in the human body contains protein and it makes up about half of our dry body weight. A severe lack of protein can affect almost every part of the body’s function and lead to muscle wastage and a poor immune system. Protein requirements change as you age, and they differ depending on body weight and gender. As a rule of thumb, Protein should ideally make up 15% to 25% of your total energy intake. Men: 0.84g per kilogram of body weight per day. For example, if a man weighs 85kg, his recommended intake is approximately 71g. Women: 0.75g per kilogram of body weight per day. For example, if a woman weighs 70kg, the recommended intake is approximately 52g. For those aged over 70, the recommended daily intake is 81g a day (or 1.07g per kg of body weight) for men and 57g a day (or 0.94g per kg of body weight) for women. Pregnant women need more protein in the second and third trimesters; their protein requirements go up to 1g per kilogram of body weight per day. Athletes and people who are very active usually can consume more protein. 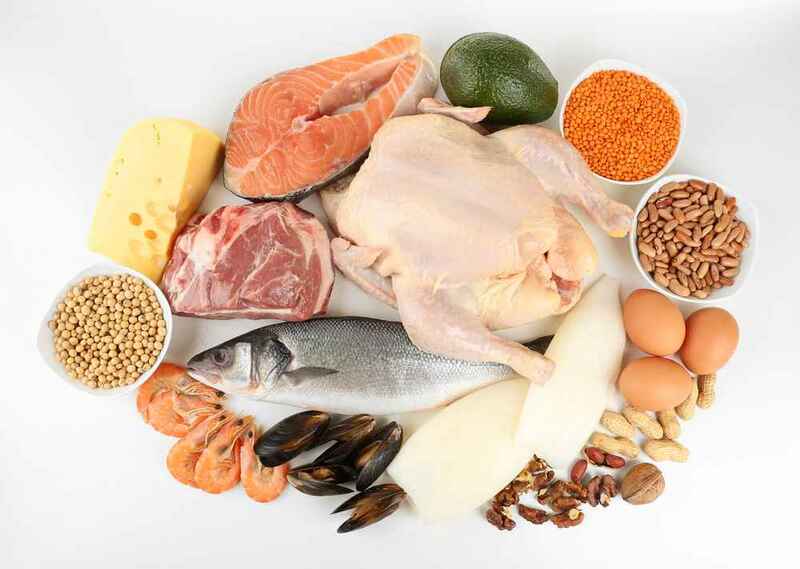 Animal products such as meat, chicken, fish, eggs, and dairy contain all the essential amino acids your body needs. Plant-based proteins like grains, legumes, pulses, and soy products are also good sources of many of the essential amino acids.